The Nicene Creed is a confession of our Christian faith. According to Holy Tradition, the Nicene Creed was composed on Pentecost by the twelve apostles. The creed contains twelve articles of Faith, each one written by one of the apostles. When members of the Church began to teach incorrect or heretical opinions, it became necessary to elaborate on the Creed, based on the teaching of our Lord, which would refute false teachings and guard against them. The Ecumenical Council of Nicea (325 AD) adopted this Creed and it was completed at the subsequent Ecumenical Councils of Constantinople (381 AD) and Ephesus (431 AD). The Creed was first used during the rite of the sacrament of Baptism. In 215 A.D., the Church Father and historian Hippolytus, in his work entitled the Apostolic Tradition, recorded that the Creed was recited in its entirety during the sacrament of Baptism. The Creed came to be used in the Divine Liturgy late in the fifth century. The purpose of placing it there was to prevent deviations of the faithful from the Orthodox faith. The Creed is followed by an anathema, which refutes the heretical teachings. The historical value of the anathema is it indicates the false doctrines that were in existence during the early days of the Church. St. Gregory the Illuminator abridged the Creed by adding a doxology, which appears following the Anathema. A doxology is a short expression of praise or thanksgiving to God. The saying of the last word of the Creed, “Amen”, is postponed in the Armenian Divine Liturgy until after the doxology of Saint Gregory. And in one Lord Jesus Christ, the Son of God, begotten of God the Father, only-begotten, that is of the substance of the Father. God of God, light of light, very God of very God, begotten and not made; himself of the nature of the Father, by whom all things came into being in heaven and on earth, visible and invisible. Who for us men and for our salvation came down from heaven and was incarnate, became man, was born perfectly of the holy virgin Mary by the Holy Spirit. By whom he took body, soul and mind and everything that is in man, truly and not in semblance. He suffered and was crucified and was buried, and rose again on the third day and ascended into heaven with the same body and sat at the right hand of the Father. He is to come with the same body and with the glory of the Father to judge the living and the dead; of whose kingdom there is no end. We believe also in the Holy Spirit, the uncreated and the perfect, who spake in the law in and in the prophets and in the gospels. Who came down upon the Jordan, preached to the apostles and dwelt in the saints. We believe also in the only One Catholic and Apostolic Holy Church. In one baptism of repentance for the remission and forgiveness of sins.In the resurrection of the dead, in the everlasting judgement of souls and bodies, in the kingdom of heaven and in the life eternal. Amen. As for us we shall glorify Him was before the ages, worshiping the Holy Trinity and the One God-head, the Father, the Son and the Holy Spirit, now and for ever and unto the ages of ages. Amen. With all our hearts, we confess and we believe in God the Father, uncreated, not born, and without beginning; who also brought forth the Son and emanated the Holy Spirit. We believe in God the Word, uncreated, born, and begun from the Father before eternity; neither subsequent nor lesser, but as much as the Father is Father, with Him, the Son is Son. We believe in God the Holy Spirit, uncreated and timeless; not born but proceeded from the Father, coexistent with the Father and with the same glory as the Son. We believe in the Holy Trinity, one nature, one godhead; not three gods, but one God, one will, one kingdom, one authority; creator of things visible and invisible. We believe in the holy Church, in the forgiveness of sins, in the communion of the saints. We believe We believe that one of the three persons, God the Word, born of the Father before eternity, in time descended into the Mother of god, the Virgin Mary, took blood from her and united it with his divinity, restrained himself for nine months in the womb of the immaculate Virgin; and the perfect God became perfect man in soul, mind and body; one person, one essence and one nature united. We believe that our Lord Jesus Christ walked upon the earth. After thirty years he came to be baptized. The Father witnessed from above, “This is my beloved Son;” and the Holy Spirit descended upon Him in the form of a dove. He was tempted by Satan and defeated him. He preached salvation to men; He labored physically, was fatigued, became hungry and thirsty. He then came willingly to be tortured, was crucified and died in the flesh, but lived as God. The body, united with the divinity, was laid in the tomb; and the soul, with inseparable divinity, descended into hell. He preached to the souls, devastated hell, and freed the souls. After three days He rose from the dead and appeared to the disciples. We believe that our Lord Jesus Christ, in the same body, ascended into heaven and sat at the right hand of the Father. He will also come, with the same body and with the glory of the Father, to judge the living and the dead, which is the resurrection of all men. O Lord, open thou my lips, and my mouth shall show forth thy praise (Psalm 50:17). now and forever, world without end. O Lord, lead us unto the paths of peace. unto the paths of righteousness and eternal life. Guide us, O lord our God, and teach us to walk in thy paths of righteousness. Keep our lives in peace, and our ways pleasing in thy sight. and prosper all the work we undertake. Let us in peace eat this food which the Lord hath provided for us. Blessed be the Lord in His gifts. who didst nourish and fill us. and condemned the enemy of our life and salvation. to whom are known our needs and necessities. And from all dangers of the soul and the body. To always think, speak and do that which is good in your sight. 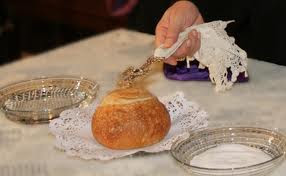 One of the holy traditions of the Armenian Church is the Home Blessing Service, which according to St. Gregory of Datev was established by Our Savior Jesus Christ, when after His Resurrection He entered the upper room and blessed the disciples. During the apostolic times, the twelve apostles of Jesus visited the homes of the faithful to bless them and to spread the good news of Christ’s birth and His Resurrection. Likewise their followers priests and bishops, entered the homes of the faithful on the occasions of Christmas (Theophany) and Easter (Holy Resurrection) to tell the good news of our Lord’s Nativity and to bless them and their homes through a special Service. Through the Home Blessing Service, the house of the faithful becomes a small church. “Grace to you and peace from God our Father and the Lord Jesus Christ.” (Philippians 1:2). During the Service the priest prays to God and asks Him to keep the home, its inhabitants, and the children in good health, so that they live a devout life, glorify the name of Almighty God and heighten the Holy Church. Love and peace are established in the sanctified home. Therefore, it is desirable that the faithful devoutly keep the graces from heaven, which filled their homes. But if sinful behavior dominates in the house it can never become a the church inhabited by the Holy Trinity, saints and angels. The peace and warm atmosphere of faithful families are so important to the church that the church fathers always preached to keep long-lasting peace. They testify that sacredness and peace are disturbed because of sinful behavior by members of the family. Therefore if there is no peace, understanding of sacredness, love, unity and harmony, God’s blessings can never be given. Thus the place which is devoid of the Lord’s protection will naturally be full of evil or devils, which “Like a roaring lion your adversary the devil prowls around, looking for someone to devour.” (1Peter 5:8). Then he touched their eyes and said, “According to your faith let it be done to you.” (Matthew 9:29), faith, repentance, prayers and fasting are expected from the family members, because “But this kind does not come out except by prayer and fasting“ (Matthew 17:20).